US Senate candidate and music producer Steven Machat has called for tighter gun control in the lead-up to the US elections. Steven is running an independent senator for the State of Florida. After last weekend’s horrific Orlando massacre he says semi-automatic and automatic weapons should be removed from the family home. Following the Orlando shooting on 12 June which left 50 people dead Steven told Noise11.com, “I believe we need gun control. Guns are not toys and they must be regulated and controlled. Semi automatic and automatics are not guns but weapons that can cause massive deaths and must be removed from home ownership”. Steven is outspoken about the power of the National Rifle Association and its control over mainly Republican politicians. “The NRA does not represent community but a section of the community,” he said. Americans vehemently hide under the 2nd Amendment as an excuse to own weapons. “That ownership must take into account what a gun means in 2016 not 1790 when the bill of rights was written,” he said. “And our founding fathers were not invincible as the constitution allow slavery and made women collateral. Not equal to a man”. Steven Machat has a pedigree in the music industry. His father Marty Machat worked with The Rolling Stones and Sam Cooke. His clients include ELO, Genesis, Peter Gabriel, Phil Collins, Snoop Dogg and Leonard Cohen. He was a producer of the 2010 Leonard Cohen documentary ‘Bird On A Wire’. As an author Machat has written four books: Highways of Man – The Odyssey Almanac, Man, Community & Living The American Dream, Gods, Gangsters and Honor: A Rock ‘n’ Roll Odyssey, Sacred Knowledge, A Rock ‘n’ Roller’s Guide to Higher Consciousness. Steven says he proudest moment was working for the Dali Lama on the ‘HOPE’ album project. About last weekend’s atrocity in Orlando Steven says, “What is most disturbing was Mateen’s ability to procure the assault weapon that caused so much death and destruction in this incident. According to sources, it was legally purchased within the last few days. He walked into a store or gun supplier and bought a weapon that no person, outside the military, should have a reason to possess. Its only purpose is to hurt and kill. What other use could it have? Over the course of his career Steven Machat has been both a Republican and a Democrat. He will stand for a Senate seat for the State of Florida at the November election. Work has begun on the world’s largest guitar shaped building. 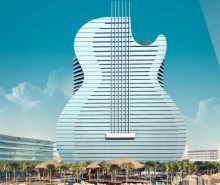 Hard Rock is building the guitar shaped tower in Florida. Underoath will return to Australia in February for the ‘Underoath Reunion Tour’. 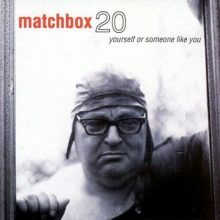 Matchbox Twenty’s now classic debut ‘Yourself Or Someone Like You’ turned 20 years old this weekend. Tom Petty has been chosen by the Recording Academy as the 2017 MusiCares Person of the Year. ’She’s So Cold’ received a first time play for 2015 at the Rolling Stones show in Orlando, Florida on Friday night.